If you have already read a number of articles contained on this website, you will have begun to realise that your local authority’s environmental health department covers a vast remit and they often your first port of call if you are experiencing problems with your neighbours or within the community as a whole. If your enjoyment of your own property is being affected by a Neighbour’s Bonfire or barbecue or if an industrial chimney is causing a problem. Where you suspect that chemicals or associated materials have polluted either a water supply or have contaminated land. If you have a problem with a Dangerous Or Nuisance Dog in your area or you have been attacked or been threatened by an attack from a dog. You’d also contact the department if you're concerned about persistent dog fouling outside your house or on local parks. If you are concerned about the hygiene of a particular business which is manufacturing and/or selling food or drink to the public, or you have suffered a health problem as a result of eating suspected contaminated food. If you are suffering from the effects of Excessive Noise as the result of a neighbour’s party, loud music, a nearby factory or some other kind of business which is generating excessive noise or if you have an Incessantly Barking Dog in the neighbourhood. 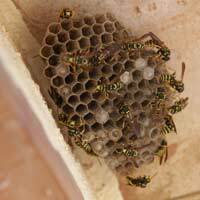 If your own home or a nearby property has been plagued by pests which could be anything from a wasps’ nest to rodent control. If flytipping has occurred on your street or if you suspect a neighbour to be guilty of flytipping elsewhere. If graffiti or flyposting is happening in your area, your environmental health department will also deal with this. If a neighbour is guilty of not disposing of their household waste correctly, or if you are experiencing a lot of litter on your property or street as the result of a business nearby. Of course, in many of these instances, the problem can often be resolved by speaking to the relevant neighbour or nearby business first. However, if you’re unable to obtain a satisfactory resolution to a particular problem from the person(s) involved, or you don’t know who might be responsible for causing the problem, then all of the above fall under the jurisdiction of your local authority’s environmental health department. They have the powers and the weight of the law behind them to begin an investigation and to enforce a resolution, be that through the courts, if necessary. I have had my garden done .next door garden is overgrown and has rats they are scratching through to my garden.my dog has been ill over last 2 years and now I think it's down to rat urine.I have told my neighbour and explained I don't want put poisoning down cause my dogs.I have bought a sensor scarer but now coming up back of my plastic shed can I complain or will clean garden the rats will lose interest. I did have decking but it's slabed and artificial grass now. new neighbours,have many visitors,and constantly swear,not moderately but all the time(e.g.13 f words/8 c words in approx. ten minutes,at the top of their voices,I hear it in the garden and in the house through the wall,my grandchildren can no longer play in my garden,their parents are wary of visiting,and I can no longer use my garden,they play music at full blast from early morning til late at night and their suspicious smelling cigarettes waft into my house.what to do? I am afraid to complain for fear of what they will do. My neighbors have the most trash in their yard, and also has 4 dogs living inside the home. At the same time they are selling produce to the public. There is this foul smell coming from inside the house that my stomach cannot handle. They store the produce right where the dogs use the restroom, so I know that this cannot be sanitary. There's also 2 vehicles parked in the yard that do not run, so it's becoming an eyesore for the other of us neighbors. What can my household do about this? I have a neighbour who's gardens are so over grown with throne bushes trees and full of rubbish and it's.nkw coming over into my garden I have also on more than 1 occasion seen rats coming from there garden through to mine, I am a single mum with a 3 year old and we cant use the front dooranymore as it's far too dangerous to step out there with him and I have had to block half my back garden off to keep my son safe also. What am I suppose to do about this. My nextdoor neighbour has a brown bin and two blue bins overflowing with household waste.It's piled up around the bins too. Unfortunately if you go to the top of the back garden you can see into each other's garden. I saw an occupant throwing more rubbish onto another mound of household waste including clothing beside the back gate. Is their anyway I can put a complaint with someone because there is an increase of flys and mice coming into my house. We have someone in our close that throws nappies in nappie sacks out onto their drive. They walk past them and can be left on the drive for 2-3 days before they pick them up. There is 6 out there now. It’s disgusting and we have never had this behaviour before in our close. Who can I report it to? A neighbours cat keeps coming into gardens in the street and ripping bin bags open. My dog got hold of a chicken bone because of this. When we put the rubbish out for the bin men they are straight out onto the bags. The cats are coming in late at night so aren't taken in at night. It also upsets our rabbits. My neighbour has two domestic oil tanks. One metal, old and rusty one, one disused plastic one, right outside my bedroom window. The metal one has residue around the pipe and is resting on breeze blocks, They are about 6 foot from my home, which is made of wood. I am sure this is against regulations? I have tried asking him but he is not very approachable. I am beginning to wonder what will happen if there is a leak. Our other neighbours have tanks but are put up into an embankment out of the way, and are plastic. I don't know if I should report him as he wont talk with me! UK. My East European upstairs neighbour has moved her wheelie waste bins to outside my bedroom window (I live in a ground floor flat). Hers is a rented community home, mine I’ve bought under leasehold, I have complained to the council about noise, dogs fouling, unsocial behaviour. What department do I complain to about the smell purveying into my property? Hi again, I am 62, quiet person, we have rear balconies times 3 per floor, Sheena f2, Millie 5, me 8. Alan f6, Sheenas now mate, Sheena goes at Millie, Alan joins in, they both tell Millie to shut up, go back indoors and watch her TV, bullying. Sheenas screams her tirade abuse, we all hear her, as do passers by. Sheena bullies, intimidates, calls Millie a husband beater, he died years ago, Millie was devastated. Lovely couple. Millie never swears, calls Sheena devil woman, Millie is in bits, seen at times in tears. There is a tenancy sections 3.4 / 3.5. in black and white, I checked. Hi, about a year ago A sheena 55 moved into ground floor flat 2, I live in flat 8, nice to start, say hi. Then Millie 84 flat 5 lovely little lady,asked Sheena lower her noise, blimey Sheena abused, tiraded abuse at Millie, from no where, now when Sheena is out back, sees Millie it is an a verbal abuse, no verbal compass at Millie. Police came too, noted. Then a while ago, Glen flat 9 my neighbor, had his daughter Lucy visit, Sheena collared Lucy front door, well Sheena let rip at Lucy, Glens young daughter, Glen defended Lucy as dads do. It happens in the communial area too. Glen called police, statements, gave Glen crime number, Orbit South wanted it to do any thing, they have everything to date now, all advice is note, on record, do not respond/react back, so we do not.Doing it the right way, Orbit know, Mr R gale local MP, so we are not is accused of saying nothing, if some thing happens. This is a brief, there is more. Thanx for the ear, good to share, input welcome. We live next door to a low rise block of flats, and their rubbish bins are located 6 metres from our house, the bins have never been cleaned in 12 years and the smell of rubbish is awful, I have contacted the owners of the flats but they are unwilling to do anything about it. Would the council be able to help? My neighbors have two dogs which I suspect are going to the bathroom in their basement because since they have moved in our basement smells like we have five animals in our house going to the bathroom. Somedays the smell is so bad I can smell it upstairs and if I go in the basement it gags me. Our basement is finished and I go down there a lot. I don't know what to do to stop the odor. They used to let the dogs go to the bathroom on the deck until we told them about that. I don't see or here the dogs out much. I can't take the smell. Is there anything I can do to stop the smell? My issue is with an upstairs neighbour storing work items (such as tool boxes, large tubs of paint etc) in the shared front garden, and also leaving large white goods which are never collected (the council can do this at a cost). I’m not sure who to contact about this as we would we all be equally liable for the mess even though it’s one neighbour causing it? And how do I report this? We were astonished last week to have an environmental health officer on our doorstep.Apparantly one of our neighbours reported us for " running a carpentry business " from our home .My husband had spent a couple of sessions sawing up some old boards which he had been given ,these were to make raised beds for our allotment.This was over a couple of days.Our next door neighbour who is a semi retired builder had spent a week sawing most days making a new decking area at the same time, we get on really well with them.Am.really upset about this we are pretty sure we know who has reported us but wonder if they have the wrong house! Our neighbour who spends a lot of time at the coast was away when officer called at our house,so we will speak to him on his return.The neighbour we think has reported us is also local councillor she made a great song an dance when my husband (who had written council permission) trimmed off some dead branches on trees which are protected but overhang our property ,We had an official come out and check that it was all done correctly which it was.They now watch at the window when we go out in the garden to see what we are doing.Its just awful. My neighbours garden is a mess all his grass is 3 foot high weeds, brambles, and old man's beard is killing my hedge. I have asked him do do something until I'm blue in the face. He got somebody ti tidy it up whilst he was away for a month, by the time he got home it was back to square one. We have had rats in the front yard and back garden. His house I am toldby his ex wife that you can hardly get upstairs and in rooms for books. Surely this is a fire hazard. Someone please help. Hello, Our bedroom facing the neighbouring building which is a businesses premise. On the ground floor of the premise is a grocery sumpermarket and on the first floor is a workshop. Recently I have noticed that they have installed a rather huge compressor which I believe is for an airconditioning system. Lately there is a humming noise coming from one of the compressors intermittently. I am not sure from which one but the humming noise has become louder even if our windows are closed. The noise now disturbs our evening and my sleep. What shall I do and who should I report this to. My neighbours have turned a stone shed next to my oil tank into a fully fitted kitchen and placed alarge gas cannister next to my domestic oil tank. They have also ran bare copper pipework adjacent to my oil tank and through a hole in the wall directly opposite the oil tank. Calor Gas have sent advice which I have forwarded onto my local council that states it is against UK regulations and a hazard. My oil company have put in writing that due to the risk they cannot supply me with oil. I now have no heating or hot water. The local council have said it is a civil matter and for me to deal with.